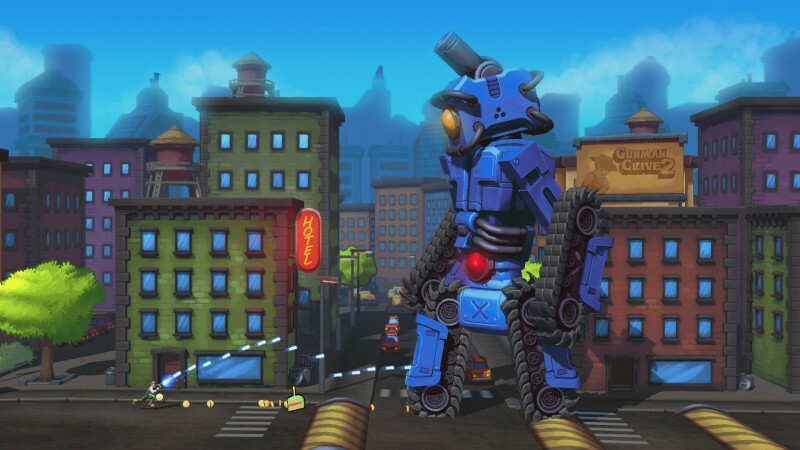 I already know what I need to do to beat the massive mech towering over me. First, I must destroy its vulnerable plate armor while dodging the lasers, energy balls, and rockets it throws my way. Then, when it hurls a punch at me, I need to jump on its fist and run up its arm to bash in the power core. I know its pattern, so I just need to survive until I can put my plan into action. 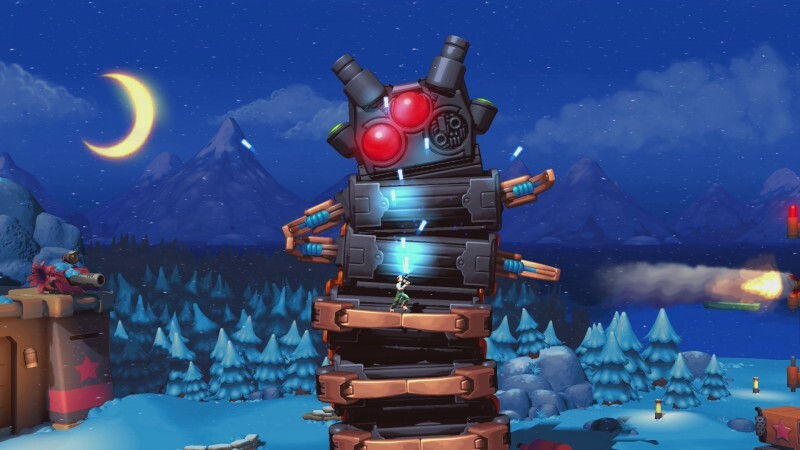 The platforming is loose, but after several attempts, I finally destroy the power core on its head. However, my celebration soon turns to dismay; that was only its first form, and now the real test of my mettle begins. 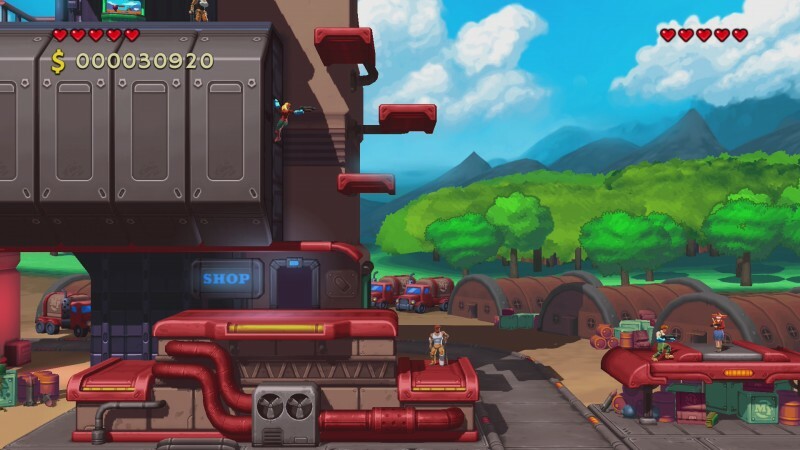 Encounters like these are common in Mechstermination Force, an intense 2D shooter that harkens back to classics like Contra and Metal Slug. 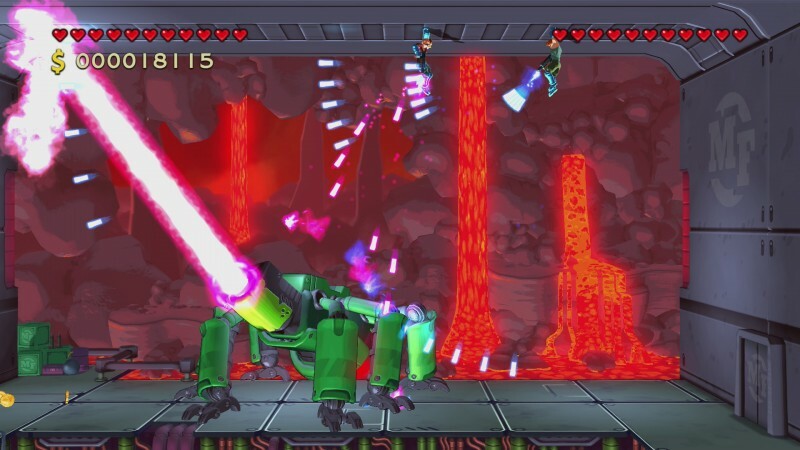 However, instead of blowing through waves of enemies, each stage is a drawn-out boss fight against a giant mechanical monster. While the controls are sometimes annoying, the loop is satisfying: You chip away at your foe’s armor from a distance, then get up close to whack an exposed power core. 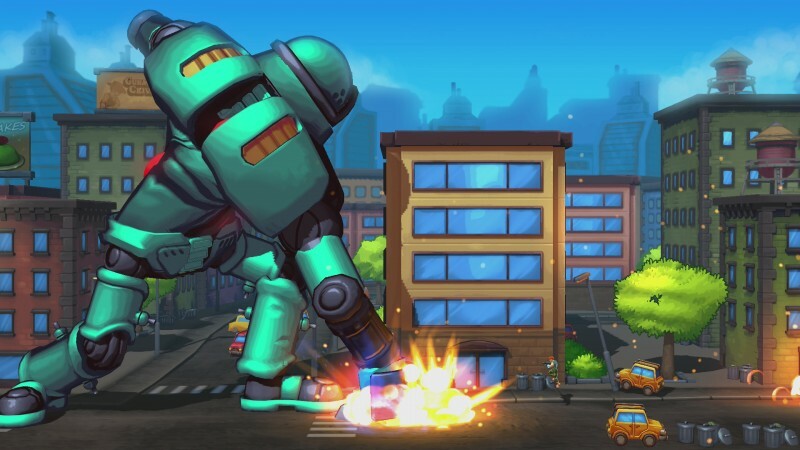 These battles are grueling, with the robots often taking multiple forms and adopting various patterns for you to learn over the course of repeated tries. 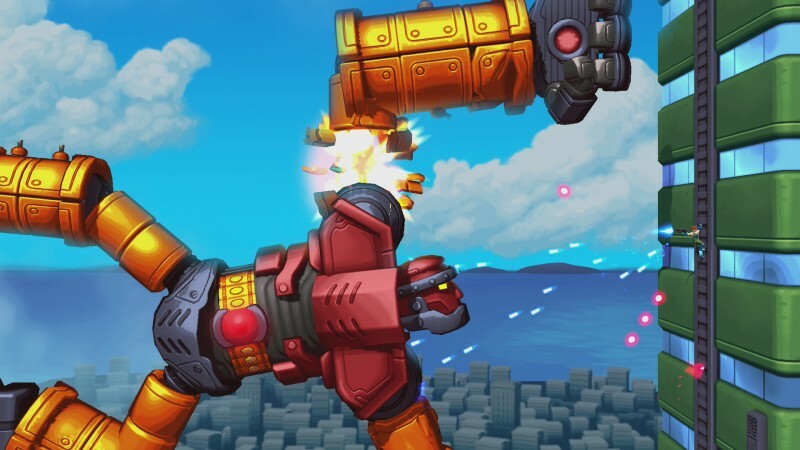 You’re going to die several times on each boss, but Mechstermination Force makes sure that you learn from your mistakes, and pushing through challenges that initially seem insurmountable makes your eventual victory even sweeter. The bosses are enormous, requiring you to climb on top of and, sometimes, through their bodies. My favorite battle was against a towering two-headed beast, which had me blasting through its insides, section by section, on the way to its two long, climbable necks. Once there, I dodged lasers and electric waves to reach the power cores. Fighting all the way to the top and taking out the two heads to kill the mech felt like a true triumph, and sticks out as the most memorable sequence of the campaign. These encounters are fun, but much like the mechs, the action has some weak points. 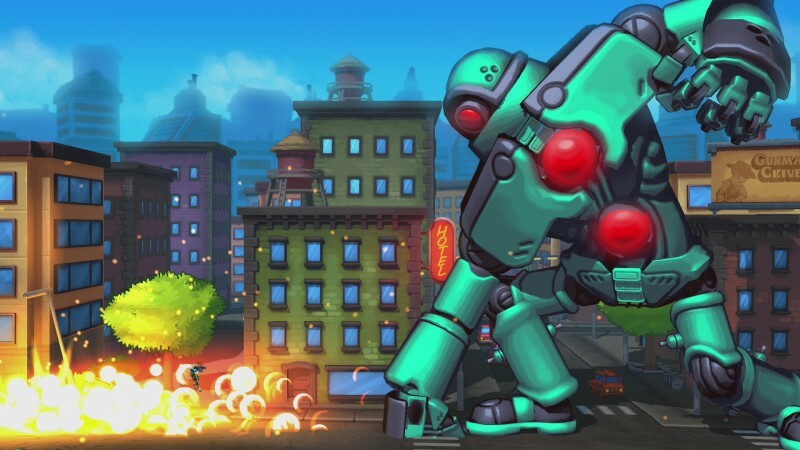 The shooting is smooth and exact, but the platforming is another story. Jumping can feel slippery, and once you unlock the ability to climb, latching onto surfaces is inconsistent. 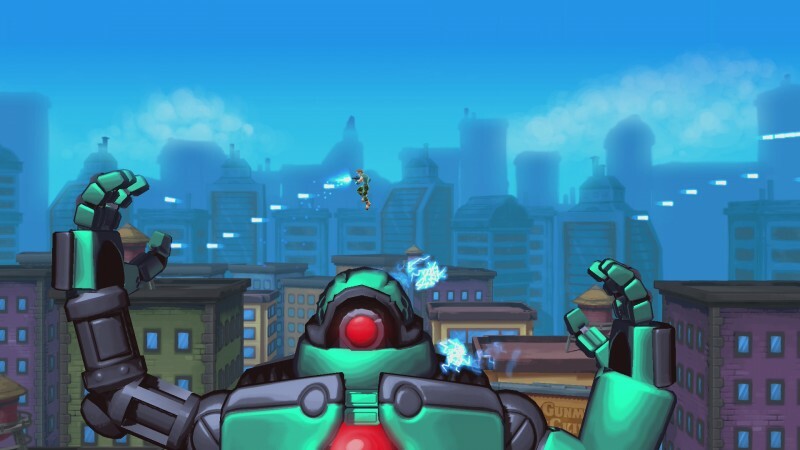 Watching your character fall all the way to the bottom of a building-tall mech because of a missed wall-grab is infuriating. Some bosses intentionally send you flying when you attack their power cores, resetting your position to scale them once more. Unfortunately, you’re sometimes thrown directly into harm’s way or down a pit, which is maddening. This experience is hard enough without extra layers of difficulty due to poor controls and random chance. This becomes an even bigger barrier during the final battle, as the skills and strategies you’ve learned are nullified. 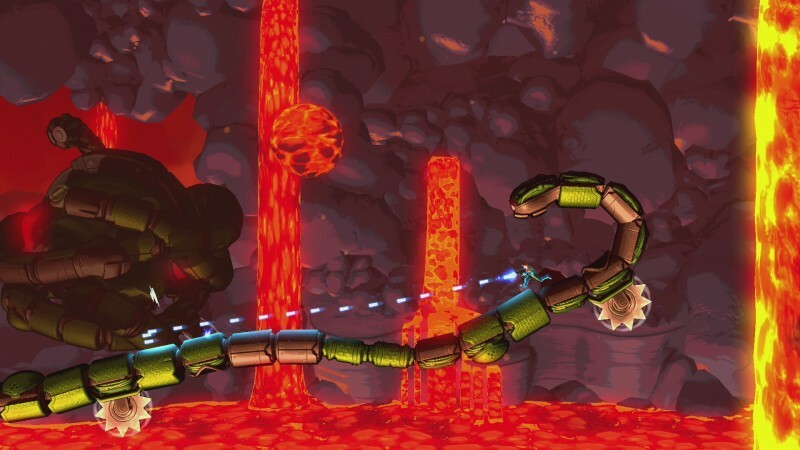 The patient 2D platforming and careful planning give way to a frantic bullet-hell space level. While I don’t mind that style, this final mech fight felt like I was playing a completely different game. This is further accentuated by the fact that the new controls (used only for this battle) are imprecise, making the most difficult encounter feel downright unfair. Over the course of the adventure, you earn thousands of coins, which can be used to purchase additional health and weapons. While the spread shot and grenade launcher are powerful in the right situations, I leaned toward the versatile laser, since it ricochets off surfaces and clears some enemy projectiles away like a windshield wiper. Unfortunately, experimentation is rarely satisfying, as the weapons all pack similar punch, and it really comes down to the firing patterns you prefer. The close-range flamethrower seems useless, and the final unlock isn’t nearly worth the price. Once I had all the weapons, I regretted buying anything beyond the laser; I should have just poured those coins into my character’s health. If a section is too difficult, you can bring a friend along through local cooperative play. Having an extra gun is awesome, and co-op partners inherit all your unlocked weapons and health upgrades. However, once a character dies, they can’t rejoin the fight. Less experienced players who die fast are left putting their controller on the table and watching the remaining player beat the boss alone. 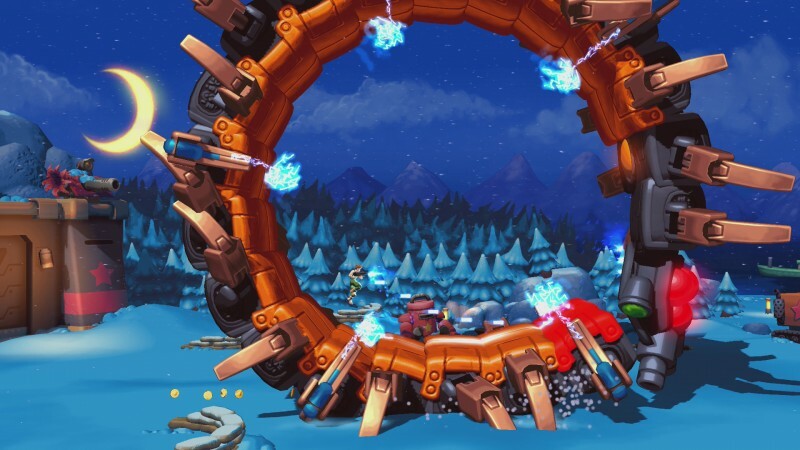 However, since the game doesn’t scale difficulty for an extra player, it is undoubtedly the easiest path to victory, providing a good way to mitigate the challenge if you get stuck. Even through my multiple gritted-teeth attempts at the battles, I loved figuring out the puzzle of how to take down each monstrous foe. Finally executing on your plan to defeat a boss you’ve been stuck on is beyond rewarding. 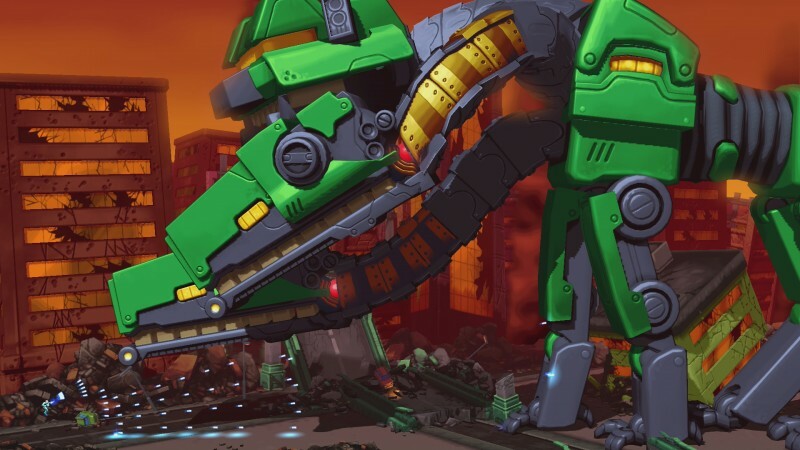 Mechstermination Force is action packed and exciting, but hit-or-miss controls and a disappointing final boss prevent it from reaching its best form. 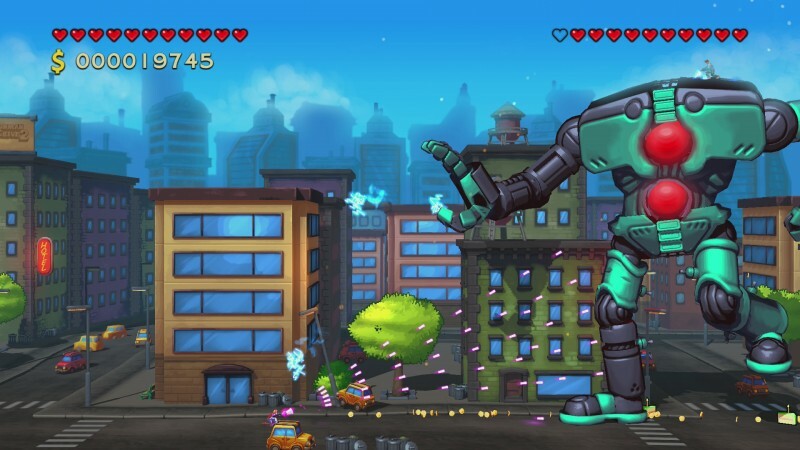 Summary: Mechstermination Force is an intense 2D boss-rush shooter that delivers excitement, triumph, and frustration.